In Berlin almost every flat object can be a billboard – and almost every round object can be a poster pillar. And ‘everybody‘ thinks, “it’s just me – hanging a single poster on that pillar” then lamp poles and traffic signal poles can easiely become huge round objects that may look like ‘real poster pillars’, but basically they are just lamp poles and traffic signal poles, burried underneith layers and layers and layers of posters. An interesting side effect: these ‘Poster Pillar’ might even work well as bumbers – so if a car would crash into one of these well-cushioned / padded / upholstered poles, the layers of posters might soften the impact – almost like an air bag. 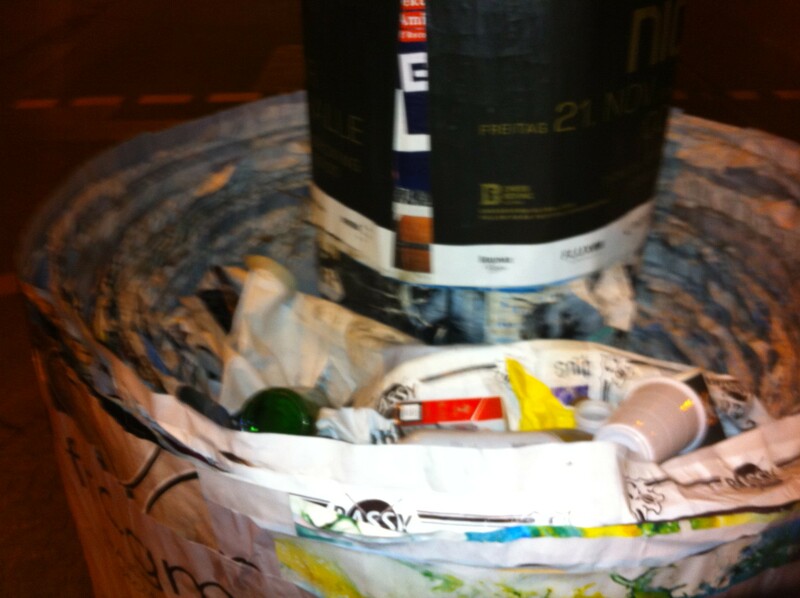 So maybe every street pole should be covered with layers of posters for the sake of safety? Maybe so. Maybe not. You probably won’t see these objects in every Berlin destrict – but at least in Mitte there are some. This one I found near Rosa-Luxemburg Platz. This entry was posted in Kreuzberg, Mitte, Prenzlauer Berg on 4. December 2014 by t.b..